Courtney and Shirley are checking out some new sounds... sounds that make them want to dance! Rob Collins dances his way through the alphabet again, going from 'G' to 'L', doing a little bit of hunting on the way. Then we visit Milikapiti as Nina Black reads 'No Way, Yirrikipayi!' about a hungry crocodile on the Tiwi Islands. Then it's off to Borroloola to sing their 'Ngulumirri (Barramundi)' song. 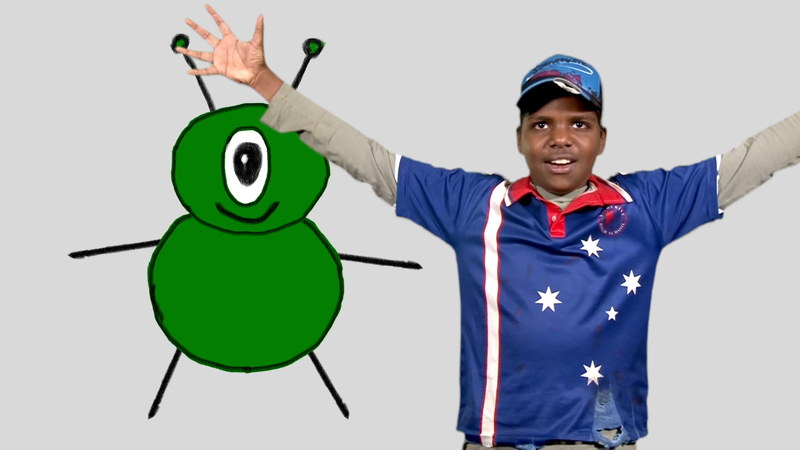 Finally we join Lathen Anderson from Katherine High School and his song about his alien friend. Sign in with your NT Schools log-in and hit the 'download' button on the top right of screen. Loved Shirley at the end credits flying by. Made me laugh. Posted On October 17, 2018 February 26, 2019 in Uncategorized with One Comment.